Conducted a Private Training Workshop for these ladies yesterday, who have varying degrees of comfort online and with social media. This session covered a lots of Technical. A next session can indulge in Strategy. Ever since I deleted Facebook from my phone this past Spring, I've been thinking about distractions, and how nice it is to not be distracted by all of the inner mumblings of all of the people out there that I have access to in that platform. Scratch that. Ever since I read the feature piece in Variety magazine last Spring about children and addiction to devices, I've been more aware of how much time I've been staring at my phone. Or of my kids staring at the phone. Finally, when I was enjoying the latest new feature from Instagram - creating Instastories by picking stickers and writing words in different fonts to be placed onto the image - I was getting constantly interrupted by Text messages and News notifications. So much so, that when they'd pop in at the top of my screen, I'd accidentally click on them because I was already going to click on the Font selection tool in Instastory, or to research more gif stickers of sparkly stars. And that's when I killed my Notifications for Text and News. Entirely. Not set on Temporary mode, where it blips up there for a few seconds and then disappears rather than waiting until you physically pay attention to it and swipe it away. It's just gone now. Don't worry - they show up on my Lock screen, and my phone vibrates when a text comes in. Oh yeah - over a decade ago, I silenced all notifications on my desktop and mobile device. If you really want to drive yourself crazy, keep all of the sound alerts on. Someone who texts me for the first time (aka not a text-versation I know I'm in) might need to wait an hour or 15 minutes for me to reply to text if I don't feel it in my purse. And you know what? That's OK! We cannot be available on-demand all the time! Convenience is getting in the way of our brains. Notifications like this are definitely triggering anyone with a hint of ADD tendencies to not focus or stay in their creative zone of a thought to complete a task with any amount of satisfaction. Want to know why you're never done in Facebook? Because there are constantly new notifications popping up in there telling you about who said what and which event they are going to. Turn it all of, and Facebook will start emailing you about it, even though you've unsubscribed from that new type email marketing they just created. Literally yesterday I got an email from Facebook: "Katie: Did you know that Susie just commented on Abby's post?" I've unsubscribed from this type of new email notification several times, to obviously no avail. You can be a great marketer in this age of distractions, but relying on tech companies to solve your problems of distraction won't work. They designed the distractions. If they design more tools to curb the distractions, you can see how that doesn't work. So. Turn them off. It's nice of Apple's CEO, Tim Cook, to speak out as a PSA about the over-use of devices, how people are using the device they produce way more than they think they are (how can they not? it's a phone, a computer, a camera, a mailbox, a video game, a TV remote) while Cook was on a media tour promoting Apple's new feature, Screen Time, that tracks everything you do on the phone, including when you physically pick it up (no thanks!). As tech reporter Seth Fiegerman put it in his article for CNN Tech: "Welcome to 2018, when tech companies hold major press events to introduce innovative ways to use their products less." Remember a time when you just had a phone. A land line, that might have been mounted to your kitchen wall. What did you do when you weren't on the phone? You took pictures outside with your camera. You drew. You kicked a soccer ball with your foot instead of flicking it across the screen with a random person maybe you are connected to in a soccer app. Your brain will thank you. You will stay informed. You will still be able to check the news headlines, or see them on your "Lock" screen when your phone is sitting idle next to you at all times. You'll just be calmer, less frazzled, and you may complete a task. With satisfaction. 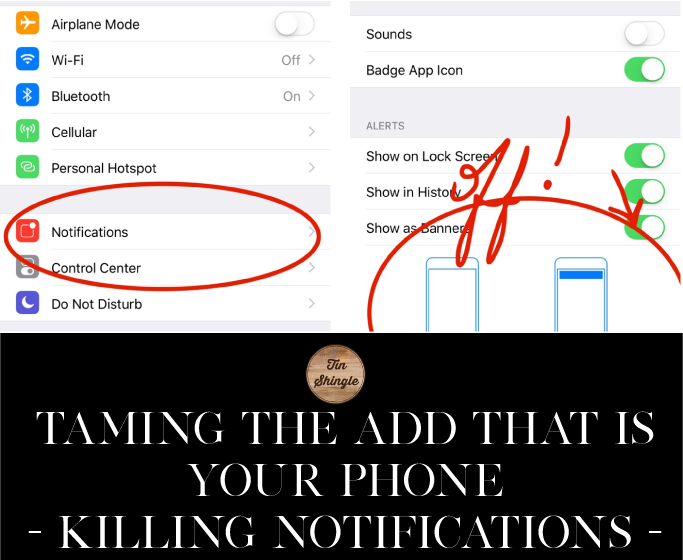 If you remove several touch-points for notifications, you'll rely more than ever on short-form writing. The headline for a news story. The subject line in the email. Don't worry - this doesn't mean we are reading less. In fact, we may start reading more because we aren't getting interrupted. But - the trigger to get us into an article will be the headline, tweet, or email subject line. Tin Shingle has a Training TuneUp for that. It's called "The Art of the Subject Line" and you'll want to follow the guidance presented in order to write spot-on email subjects that keep your open rates high, and your audience keeping up with what your business is doing.